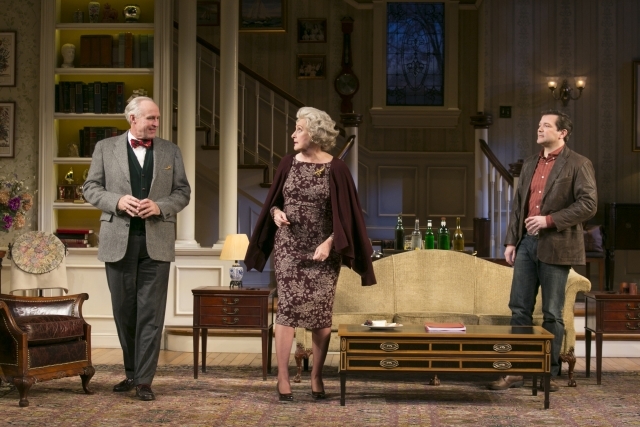 Peter Thomson (Bradley), Kandis Chappell (Ann) and Rod Brogan (John) in the Guthrie Theater’s production of The Cocktail Hour. The deliberately self-conscious comedy, The Cocktail Hour, is about a playwright who has written a play about his relationship with his immediate family members and what happens when he asks them to give them his blessing before he has it produced. It’s a thinly veiled attempt at autobiography and benefits from the clever wit we know from the more widely produced Gurney comedies like The Dining Room and Sylvia. Protagonist John is at odds with his parents’ alcoholism which the title euphemistically refers to. Moreover, he is truly bugged by his father’s condescending attitude toward the arts, his mother’s complacency, and his sister’s reticence to pursuing her dreams. The play makes a strong case for the need to beat your own drum and not fall into the expectations you are born and conditioned into. At the Guthrie Theater The Cocktail Hour has been directed with sharp intelligence by Maria Aitken. Rod Brogan as John and Peter Thomson as the father, Bradley, are delicious in their verbal combativeness. Though Kandis Chappell’s voice needs more range she humorously and poignantly embodies well-to-do New England repression as Ann, Bradley’s wife and John’s mother. Charity Jones as sister Nina elicits authentic frustration of a woman who can’t yet see a way to make her dreams come true. 818 So. 2nd St., Mpls.